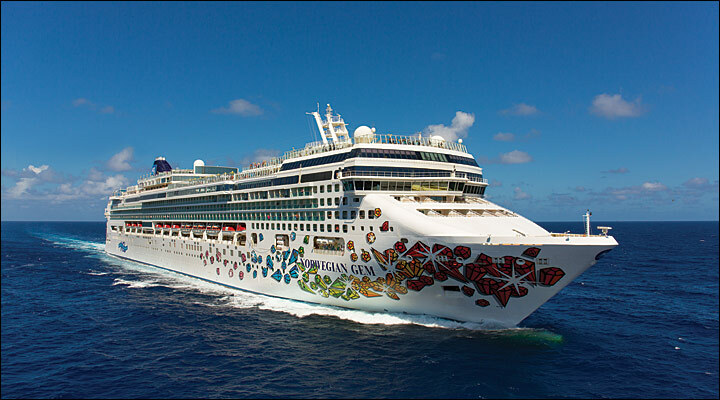 Norwegian Gem is a sparkling cruise ship. Refurbished in 2015, ship-wide enhancements include newly designed public areas, revamped Haven spaces, fresh decor, modern finishes and more! Chill out by the pool, get lucky in the casino, unwind at the spa, and make the kids happy with Wii games and lots more. From top to bottom and from bow to stern, Norwegian Gem has enough onboard activities to fill every minute of your cruise. Indulge in a refreshing swim in the pool or a relaxing dip in one of the covered hot tubs on the pool deck. Wanna get lucky? Bet it all on one of the many casino games. And when all is said and done, enjoy a pamper session at the spa. With so many bars and lounges to discover, finding your favorite may take a few days. Pop some bubbly and toast to the good life inside Magnum’s Champagne & Wine Bar. Kick back with a cocktail then dance it out at Spinnaker Lounge. Or work on perfecting your tan as you relax poolside at Topsiders Bar. Whether you’re looking to meet up with friends or make new ones, there’s always an opportunity to mix it up. Serving a wide variety of culinary delights to please every palate, the complimentary dining options include two main dining rooms, a help-yourself buffet and a variety of casual cafés, grills and on-the-go choices. Or enjoy a night of gastronomic proportions at one of many specialty restaurants. Sip your favorite cocktail as you select from choice cuts of Certified Angus Beef at Cagney’s Steakhouse. Enjoy delicious pasta made with the freshest ingredients inside the rustic and chic Italian eatery, La Cucina. Or savor French cuisine at Le Bistro. No matter what you choose, any dining option features the tastes you’ll crave. 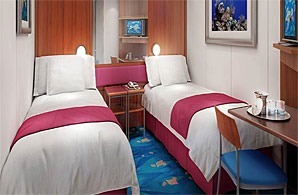 These Inside Staterooms are the most affordable way to cruise. There's room for up to four guests and they include two lower beds that convert into a queen-size bed and of course, you'll have room service and many other amenities. Approx. Size: 143 sq. ft. 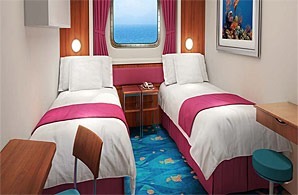 These Oceanview Staterooms have enough room for up to three guests. 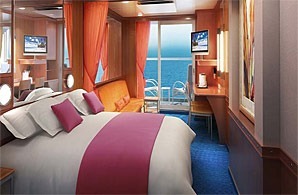 Includes two lower beds that convert into a queen-size bed and additional bedding to accommodate an additional guest. 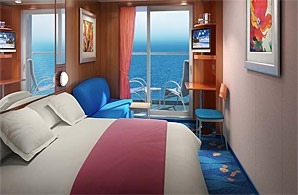 You'll also have an amazing view to enjoy from your big picture window (or porthole depending on category), along with room service and many more amenities. Approx. Size: 161 sq. ft.
Up to four guests can stay in these Mini-Suites that come with a sitting area, luxury bath with shower, two lower beds that convert into a queen-size bed and additional bedding to sleep two additional guests. Not to mention you'll have a private balcony to enjoy the incredible view. Approx. Size: 285 sq. ft.